FluoroCycle is a voluntary product stewardship scheme that seeks to increase the national recycling rate of waste mercury-containing lamps. 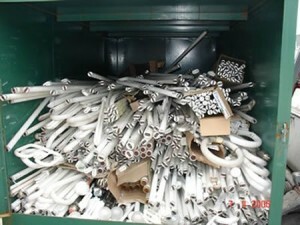 Lamp recycling can help reduce the amount of mercury being sent to landfill. FluroCycle is funded and operated by the Lighting Council of Australia, orginally established with funds from the Federal Government. Why does Australia need FluoroCycle? e the largest single source of mercury, and their disposal is the main source of Australia’s total annual emissions of mercury. EVERY FLUORO TUBE and CFL BULB CONTAINS MERCURY…. …..if they crack, evacuate the room so better to recycle. Who are the target Signatories? FluoroCycle targets businesses which operate, maintain or supply commercial and public lighting which accounts for the majority of lighting waste. What does it mean to be a Signatory? The key responsibility of being a FluoroCycle signatory is to keep mercury out of the environment. This means taking an active inyterest in what happens to fluorescent tubes and CFL bulbs when they are being replaced or removed. Every signatory will have policies, procedures, audits and other controls to ensure that any fluoroescent tube that is in a building is safely handled, especially when it comes to disposal. There are signatory companies who will pick up spent tubes and bulbs in containers and take them to a dedicated crushing and re-cycling plant. There are only two machines in the Sydney basin and this means making sure you have details of companies set up to transfer the fluorescent waste safely to these locations. You will be doing your company and our natural environment a big favour by joining FluroCycle and encouraging every one to get their mercury waste properly captured rather than having it leak into the natural environment. Where can I find information on lamp recyclers in Australia? Smaller organisations may wish to contact EcoCycle or Lamp Recyclers to purchase their EZY-RETURN Recycling Packs which can be filled then dropped off at any of Australia Post’s 4000+ outlets nationally.